You may return goods to us within 14 days, providing they are in their original condition (new, unused, unworn, unwashed, tags still on), for either an exchange, credit or refund. Footwear must be returned in their original box, undamaged. The courier cost is non-refundable. 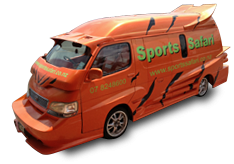 Please include proof of purchase and send to - Sports Safari, 757A Te Rapa, HAMILTON 3200 - Online Returns. There are 3 1/2 days that we have to be closed under the Shop Trading Hours Repeal Act 1990 - these are Christmas Day, Good Friday and Easter Sunday. Anzac day we open at 1.00pm. Please also note that during the Xmas/New Years period, our hours do change. We accept all major credit cards, ie: Visa, Mastercard, American Express and internet banking. When you place your order online, you will be prompted as to how you would like to pay. However, we do not accept internet banking for Australian orders, only credit card. Yes, we re-string squash and tennis racquets. Prices start from $45.00 - $60.00. We cut most types of keys. Prices start from $7.00. We can screenprint your name and/or favourite number on the back of your jersey. Please ask instore for more details. We offer a wide range of darts, dartboards and accessories. Please come instore to view and/or try-out. Please click on the "delivery" link at the top left of this website, and this will explain all about our delivery of goods to you.